As I knit my rough draft, I worked out the following chart. I wasn’t sure at first if I liked the results, but I think I do. For one thing, I like the way that each diagonal ovally section is completed over three pattern repeats. I think that the decrease lines of this might make a scarf collapse along the bias. I do regret not managing to put in no-stitch squares to make the pattern match the result more clearly; this one gave me fits and I just had trouble. If there’s interest, I would probably be willing to give it another try for the sake of learning to do better! Stepping Stones is a multiple of 5 stitches and 12 rows. Designers, please feel free to use this stitch in your patterns. Please note the Creative Commons license below (only a few of my older stitch patterns have this). Row 1 (RS): *k1, k2tog, yo x 2, ssk; work from *. Row 2 (WS): *p1, (k1, p1) in double yo, p2; work from *. Row 3: *k2tog, k1, k2tog, yo x 2; work from *. 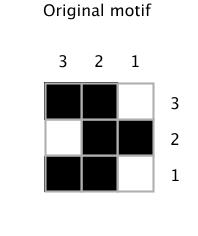 Row 4: *(k1, p1) in double yo, p3; work from *. Row 5: *yo, ssk, yo x 2, sssk; work from *. Row 6: *p1, (k1, p1) in double yo, p2; work from *. Row 7: *cdd, yo x 2, k2tog, yo; work from *. Row 8: *p2, (k1, p1) in double yo, p1; work from *. Row 9: *yo x 2, ssk, k1, ssk; work from *. Row 10: *p3, (k1, p1) in double yo; work from *. 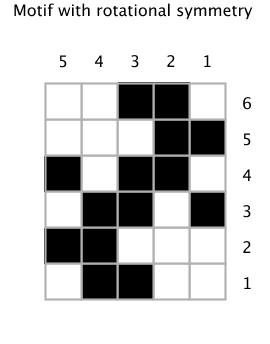 Row 11: *k2tog, yo x 2, ssk, k1; work from *. Row 12: *p2, (k1, p1) in double yo, p1; work from *. 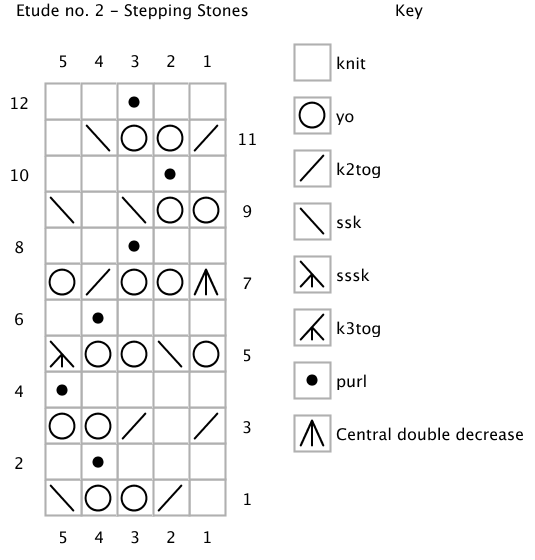 knitting stitch pattern: Stepping Stones by Naomi Parkhurst is licensed under a Creative Commons Attribution 4.0 International License. Hey! What size needles did you use for yours? Hi! I’m afraid I’m not certain; this post is a few years old. I don’t keep track of my needle size for these swatches. I’m also not sure what yarn I used, or I could give you a guess. Because individual knitters’ tension varies so much, it might not help in any case. A swatch to get a general sense of what needle size you like with your yarn is probably in order. What I can tell you is that I’m a tight knitter. For lace, the needle size I use does depend on my mood to some extent (how open do I want the holes to be? ), but I usually use the needle size recommended on the yarn label, or one or two sizes larger.